This periodical display has an eye-catching design unlike any other literature holder you've seen! 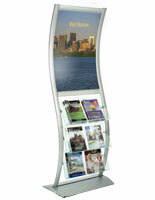 The indoor fixture, periodical display uses (3) green-edged acrylic pockets to hold your catalogs. 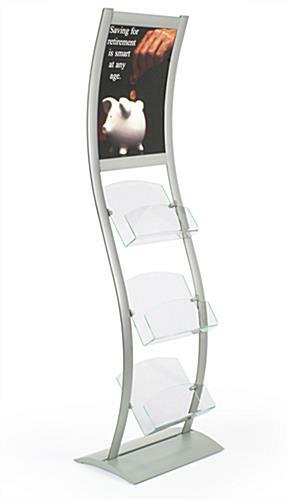 This periodical display, also known as a catalog display, helps you organize your reading materials in a modern way. The catalog stand, periodical display is a great display for both stores and waiting room areas. A convenience store would benefit from the addition of this rack as customers are drawn to its unique design. 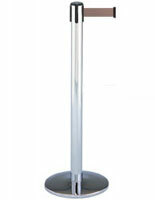 This periodical display is constructed from brushed aluminum and features a beautiful, silver finish. Not only will aluminum resist rust, when used indoors, it will also look sleek! This literature stand is also an adjustable periodical display, with its moveable clamps. 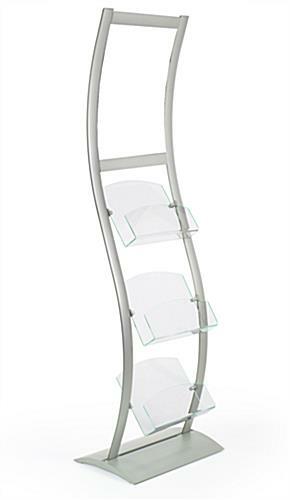 Simply slide each bracket up or down each side support, until you reach a desired height for your acrylic pockets. 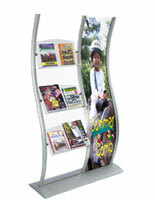 We even provide the periodical display with (2) clear, plastic lenses to protect your posters. You can also use these lenses to create a double-sided fixture! 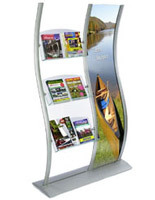 This periodical display, such as our other wave-shaped systems, adds a modern element to any store décor. 18.0" x 81.0" x 16.0"